Kailen Offutt was just four years old when her baby brother, Kulen, was born sleeping and never made it home to join his three big sisters. A Corner of Heaven shares a family’s journey through expectation and joy, to heartbreak and loss, and back to hope and happiness. 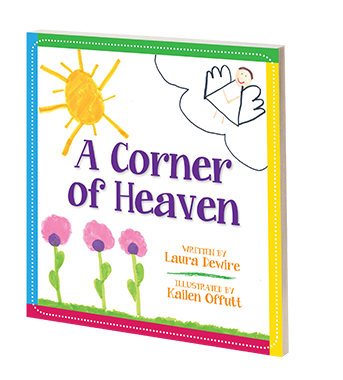 Illustrated by Kailen, now nine, A Corner of Heaven is a comforting gift for grieving families, providing a resource for parents to help their young children understand, discuss, and process the loss of their long-awaited sibling. Grandparents, godparents, aunts and uncles, and family friends will find A Corner of Heaven to be the perfect way to express their sympathy and support at a time when mere words seem to fail. 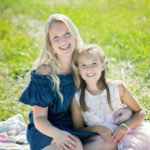 A portion of the proceeds from sales of A Corner of Heaven will benefit Now I Lay Me Down to Sleep, a nonprofit organization that provides remembrance photography to grieving families. Author Laura Dewire explains the inspiration behind A Corner of Heaven. Author Laura Dewire is a dog-loving, coffee-drinking glitter fanatic from Wauwatosa, Wisconsin. She lives in Ohio, where she enjoys teaching her first- and second-graders at Saint Michael School and practicing yoga at her local library. She enjoys a red lip, a cold can of Diet Coke, a warm doughnut, and cooking in her cast-iron skillet. She tries with all her heart to live and love like Jesus every day. Illustrator Kailen Offutt likes her ponytails smooth and her crackers with cottage cheese. She’ll do anything for strawberries, and she enjoys riding her bike and swimming on warm summer days. She has been known to break into song at random times throughout the day. She loves her family, Jesus, school, and dancing. A Corner of Heaven is distributed by Baker & Taylor Publisher Services.